This is the story of a single-handed sailing trip from England to Australia in 1975/6 in a 22ft. Westerly Cyrrus yacht before the days of computers and GPS, i.e. with only the sun, the stars, the moon, a sextant and a compass as a guide. It is also rather a desperate love story between a middle-aged divorced United Nations simultaneous interpreter (me) and an Australian delegate (Peter) at international telecommunication conferences in Geneva, who had been listening to my voice in his headphones for years. We met one day in 1974 when he plucked up courage to tell me at the coffee bar that he had been to the theatre the previous evening and seen a Gilbert and Sullivan operetta where one of the singers had looked rather like me, only a bit taller and slimmer. I let him go on for a while before confessing that it was me. After that we often chatted over coffee, gradually got to know one another and fell in love. 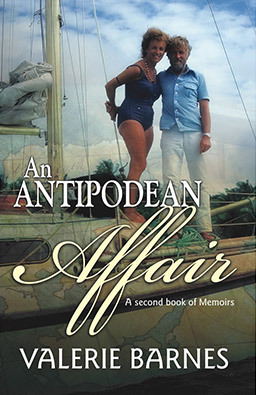 In 1975 he decided to sail single-handed from England to Australia to separate his old Melbourne public servant life from his new life with me. The story is told in first person. It starts in Geneva when we met and then moves to London and Chichester, on to France and the canals, then Spain, Ibiza, the Canary Isles, Barbados, Bequia, various islands in the Caribbean including Tobago Cays and Grenada, then the Marquesas, Tahiti, Bora Bora, Rarotonga and finally Australia. All these places are described as well as my experiences on board - I had never been ocean sailing before and couldn't swim. There are extracts from the yacht's log and some letters describing Peter's experiences when I was not there. While crossing the Atlantic he was hit on the head by the boom, he lost the rudder off the coast of Venezuela and was attacked by sharks in the Pacific. The trip took eighteen months, of which I spent a total of five with him in various places in between UN conferences. In the course of our travels we met many colourful characters, especially in the Canaries where we were befriended by a famous local poet who was also a Count and by the owner of a fish restaurant who wanted to marry me and make me the multilingual queen of his supermarket. We came from very different backgrounds - he was (and is) very Anglo-Saxon and I was (and am) very European so our reactions were always very different but I was so much in love that I hardly noticed the discomforts and rigours of sailing on rough seas, wearing damp, creased clothes and showering by means of a bucket of seawater poured over one another. Our rosy plans for the future were shattered when his 24-year-old daughter, hitchhiking in Sri Lanka, caught hepatitis and died. In his grief he switched off his radio and thus became untraceable. I flew to Tahiti to look for him but he had already left. So I took another plane to Bora Bora but found he had already left there too. The waiter at my hotel, Henri, said: 'I doubt if he is still alive. His sail was torn and he left in the middle of a violent storm but didn't seem to care.' However, just as I was about to catch the plane back to Geneva, a yacht appeared on the horizon. As it neared the wharf I could smell frying bacon and eggs. No Frenchman has bacon and eggs for breakfast: I knew it must be an Englishman or an Australian. It was. Standing on deck, unwashed, unshaven, desperately grief-stricken, was Peter.